Notes: These are Botswana agate from Africa. In my opinion it is among the best of tumbling materials. It has fine patterns with little to no quartz and will take an exceptional polish. The representative group is pictured wet. The price is $5.00 per pound. There is a 5 pound minimum. 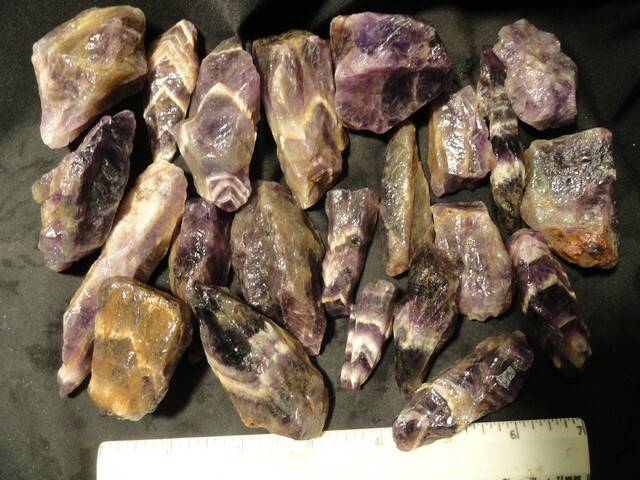 Notes: This is chevron amethyst from Africa. It has a fine pruple color with a nice chevron pattern. 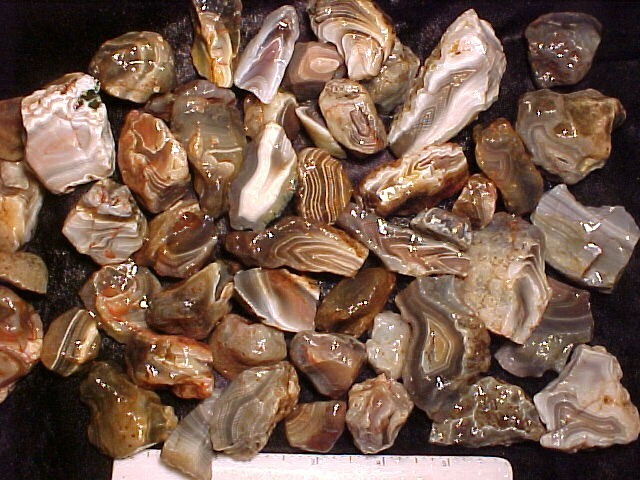 It is more difficult to tumble than agate, requiring a little more cushion. The representative group is pictured wet. The price is $7.00 per pound. There is a 5 pound minimum. 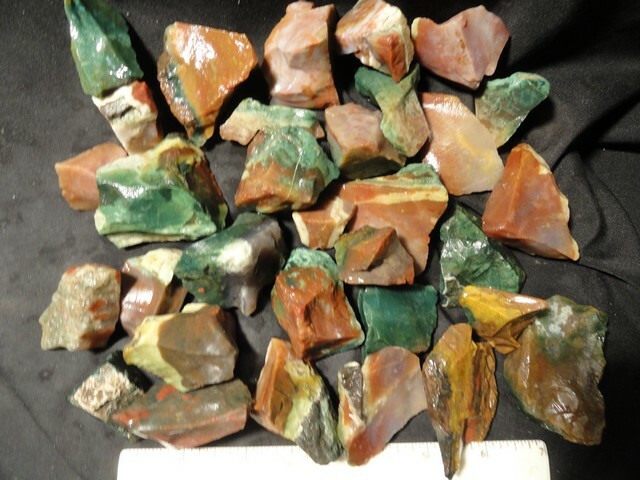 Notes: These are nice fancy jasper/bloodstone from India. They are of a nice size and will take a very nice polish. The representative group is pictured wet. The price is $4.00 per pound. There is a 5 pound minimum. Notes: These are carnelian agate from India. They are of a nice size and will take a very nice polish. The representative group is pictured wet. The price is $4.00 per pound. There is a 5 pound minimum. Notes: These are a light green adventurine from India. They are of a nice size and will tumble well. The representative group is pictured wet. The price is $2.00 per pound. There is a 5 pound minimum. 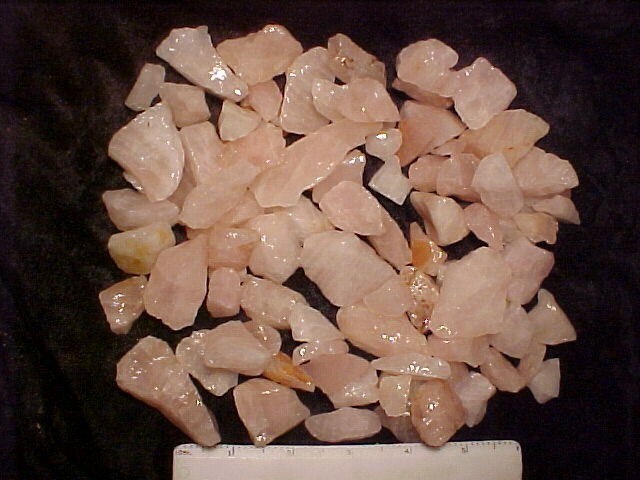 Notes: This is pink quart from Africa. It is a great material for tumbling. The representative group is pictured wet. The price is $3.00 per pound. There is a 5 pound minimum. Notes: These are gemmy garnets of a very small size. They make a very good cushioning media for tumbling and will provide some craft stones if taken to completion. The representative group is pictured wet. The price is $4.00 per pound. There is a 5 pound minimum. Notes: Here is offered very nice small ceramic rods for tumbling media. The pieces are just over 1/4 inch in length and work very well for cushioning stones during the tumbling process. They are especially good for the finer grits and polishing. The price for 5 pounds is $3.00 per pound or 10 pounds is $2.50 per pound, or 50 pounds or more is $2.00 per pound. Notes: This is amethyst from India. It has a fine pruple color. It is more difficult to tumble than agate, requiring a little more cushion. The representative group is pictured wet. The price is $5.00 per pound. There is a 5 pound minimum. Notes: Green tree agate is from India. It is a finely patterned material and is a good tumbling material. These are somewhat larger pieces and are pictured wet. The price is $3.00 per pound. There is a 5 pound minimum. Notes: This tumbling material is Moonstone from India. They will tumble well and take a nice polish. They are slightly softer than agate and will fluoresce red under short wave. The representative group is pictured wet. The price is $2.00 per pound. There is a 5 pound minimum. Notes: The picture is of a representative lot. This is an offering of whatever I have which will tumble well. It will include items similar to the pictured group. The price is $3.00 per pound. There is a 5 pound minimum. Notes: These are clear quartz crystals from Africa. They are clear and any color showing in the picture is just surface stain. 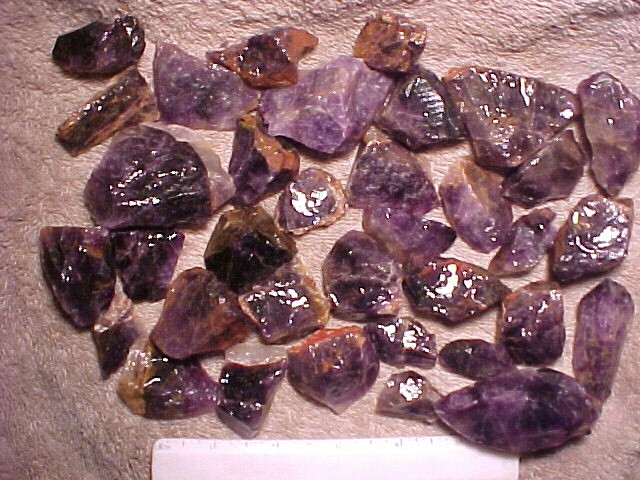 They tumble nicely and if care is taken will produce very nice gems. The representative group is pictured wet. The price is $6.00 per pound. There is a 5 pound minimum. Notes: These are a nice green moss agate from India. They are of a nice size and will tumble well. The representative group is pictured wet. The price is $3.00 per pound. There is a 5 pound minimum.